East Poultney is a town that was built over the course of a century. East Poultney Schoolhouse (1896) shortly after construction. The result is this schoolhouse, the last major building constructed on the green. It offers the simple patterns of Queen Anne style, such as the small-paned lattice of the windows and the straight lines of the roof. The designers created a sense of depth through the fish-scale pattern of the shingles, the filigreed detail in the upper gables, and fanlights framing a recessed entrance. 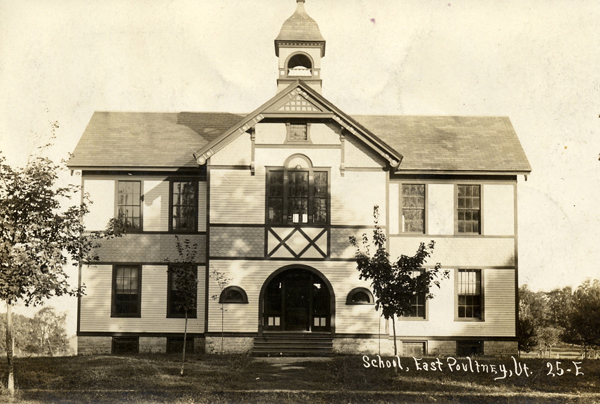 The East Poultney Schoolhouse accommodated 8 grades, 4 in each downstairs classroom with an auditorium on the second floor. 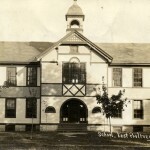 It was one of 4 schools that consolidated students from one-room schoolhouses around the larger township, and it served its students until 1966. Today it’s maintained by the Poultney Historical Society and houses its offices, research library, as well as the bulk of its historic collections. 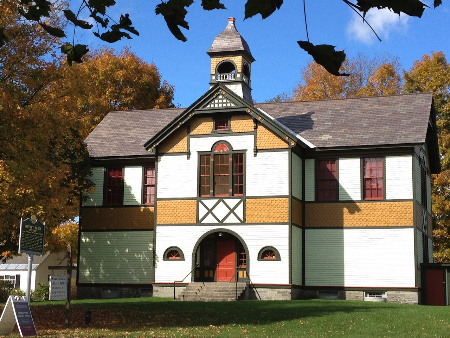 The Schoolhouse was restored to its original color scheme in 2012 with the advice of Leonard Spencer, a prominent Victorian architecture and paint expert from Cabot, Vermont, and the talented team from LuxBrush Painting Company of Manchester, Vermont.